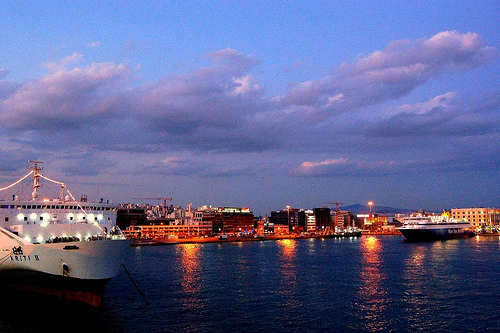 Port of Piraeus is the biggest passenger port in Europe and the third in the world. The port of Piraeus is located 7 miles (11 Kms) from the Athens city center. It is the chief port in Greece, the largest passenger port in Europe and the third largest in the world, servicing about 20 million passengers annually. Millions of people who like cruising visit Greece – the sea paradise of Europe – with its beautiful islands such as Santorini, Mykonos, Crete, Rhodes and many more. Most of the Mediterranean cruise itineraries include the port of Piraeus as most cruisers want to visit Athens with its glorious monuments and the Acropolis, the symbol of beauty and Democracy. The Piraeus port has two cruise ship terminals. Cruise terminal A and cruise terminal B. They are connected with shuttle buses and it takes only a couple of minutes to go from one to the other cruise terminal. Cruise terminal A is more frequently used for exit. Round trip transportation and tour in small groups. Athens Walking Tours offers shore excursions for cruisers. We have designed tours to accommodate cruise ship passengers so you can get the most out of your visit in town even in a very limited time at very advantageous rates. A tour for example of seven and a half hours which includes roundtrip transportation, guided tour at the Acropolis by a licensed tour guide, entrance fees and free time in Plaka costs only 59 Euro per person. OPTION A > PUBLIC TRANSPORTATION MEANS: The most inexpensive way. BY METRO: Average trip time one hour, cost 1,40 € one way. Purchase your tickets either at the cashier of the station or in the automatic machines. To get to Piraeus metro station, you will either have to walk from the pier to the metro station, 20 – 30 minutes depending on the pier the ship docks or take the 843 bus from outside the dock to Piraeus metro station. You get the metro direction KIFISSIA (line 1) and in 20 minutes’ ride, you reach the MONASTIRAKI metro station.You can get off here if you want to spend some time in the Flea Market or change into line 3, direction AIRPORT and you get off at the next station which is SYNTAGMA the central Square of Athens located in front of the Parliament building, meet with the licensed Athens Walking tours guide inside the Syntagma metro station underneath the hanging clock. How to find your tour guide? Look for the orange colored Athens Walking Tours sign. Cruise ship clients, who like to mingle with the everyday life of the Athenians, enjoy both the walk and the ride and by following our instructions, always come to Athens without any difficulty or problem. BY BUS: If you dock at Cruise Terminal B or Terminal A you can take bus 040; the bus terminal is just outside the Cruise Terminal B pier on Akti Xaveriou road and there is a stop also close to Terminal A. Bus 040 will take you to Filellinon road by Syntagma Square.You may have some difficulty though to purchase your ticket as usually tickets booths are closed. So we would advise you to use the metro instead. OPTION B > By Taxi: More Expensive. Average trip time 30 minutes (depending on traffic). Cost: 16-20 Euro for the ride one way. You can use a taxi which is a more expensive option than public transportation means. Coming out of the cruise terminal you will come upon many taxis. Usually, they try to sell you the transfer with a tour. You should know that taxi drivers are not licensed to give you a guided tour, are not qualified nor authorized guides. In Greece, it is only licensed guides who are allowed to give guided tours. It is convenient and comfortable though to use a taxi for your transfer; most taxis are air conditioned and clean cars, drivers speak at least basic English and can be very helpful. You can also make it up with them to take you back to the port. Do not bargain for the price or do not make up front a price. As soon as you get into the taxi, they should turn on the taxi meter and you pay as much as the taxi meter says. This comes up to about 16 to 20 Euros depending on the traffic. This fee is for the ride and not per person. You can share the fee with 4 people; this is the maximum a taxi takes. OPTION C > Taxi pick up service by Athens Walking Tours. The most comfortable way.You will recognize your driver from the orange colored Athens Walking Tours sign he will be holding. Average trip time 30 minutes. The cost is 35 Euro per ride. Waiting time of our driver for you at least half an hour. The Athens Walking Tours offer transfers with luxury Mercedes – non smoking car no smoking driver – from the port of Piraeus to accommodate cruise ship passengers for their shore excursions in Athens. You can book this transfer independently or with your tour by booking at athenswalkingtours.gr. Instructions how to meet with your taxi driver will follow with your confirmation letter. Also, check out the New Bus Line connection Piraeus port to Syntagma (X80) that enables you to join the Athens Walking Tours! This entry was posted in Athens News, Cruising, Piraeus, Shore Excursions, Transportation, Usefull Tips and tagged bus, cruise terminal, cruisers, Free time in Plaka, metro, pick up, roundtrip transportation, shuttle bus, smallgroup, taxi transfer. Bookmark the permalink.